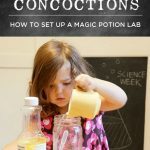 Have you tried the baking soda and vinegar experiment with your kids yet? 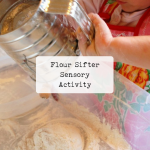 Yesterday N skipped her nap and requested “gooey flour and water” for her quiet time activity. Did you hear me sighing? I sort of had “read books” or “play with a puzzle” in mind, but I guess that would be too much to expect when we rarely sit down and work on puzzles during non-quiet times, right? I had a million little things in the hopper, but it seemed like a reasonable request. So, there she was, inches deep in flour, salt, water, and white vinegar. 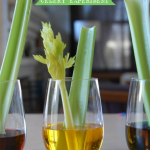 With its clear color and acidic smell, the vinegar gave this sensory project an elevated feeling of alchemy. She liked the smell of it, then tasted it, and then tasted everything. As I was sitting there watching this serious game of ingredient exploration unfold, I remembered the ol’ vinegar and baking soda trick! 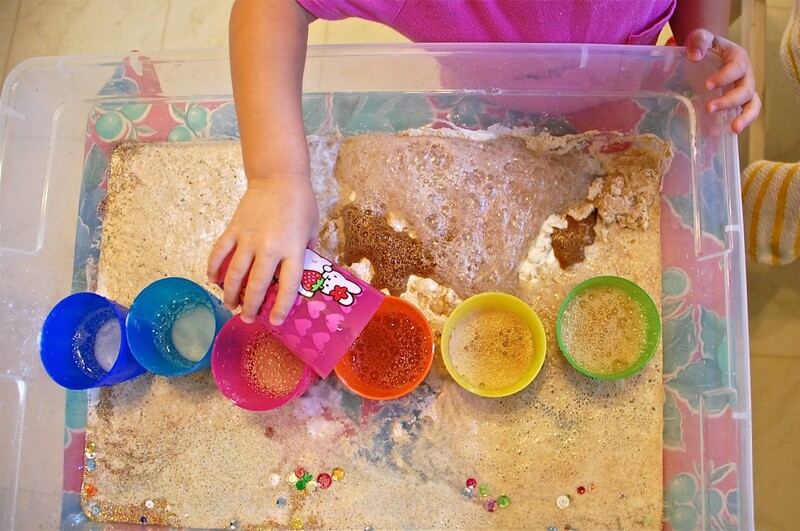 So I brought out the baking soda and asked innocently, “would you like to add some baking soda into your cups?” Of course she said “yes,” and her reaction to the merging of the vinegar and baking soda made missing a nap totally worthwhile. 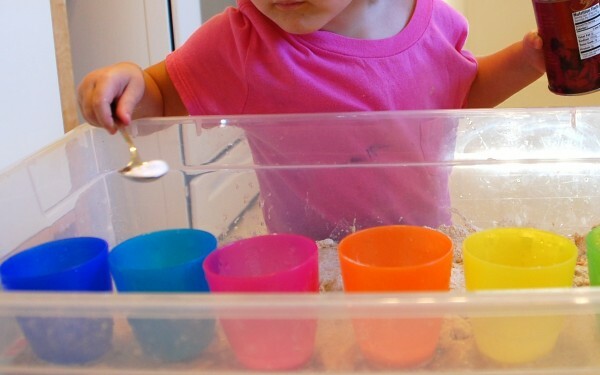 First she add baking soda to all of the cups and then she poured vinegar on top of the baking soda. 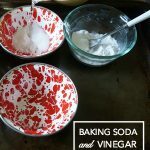 We played this game in both directions: adding vinegar to baking soda and vice versa. After depleting my white vinegar reserves, she begged me for more. (Hey! This project is a winner!) Since I was also sort of curious about how the other vinegars would react to the baking soda, I reluctantly handed over my red wine and balsamic vinegars. 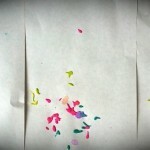 They each bubbled, but had slightly different reactions. You are seriously the coolest mom ever! All this tired mama can manage is “nap”? Your two year old still naps? Lucky you! This looks like so much fun – I think I will have to give it a try! 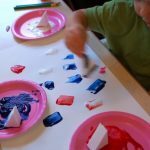 I just did this with my five year old the other day and he loved it! it’s pretty irresistible. i remember enjoying this is grade school, and thought children older than my own would love this too. are you kidding? 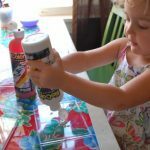 i love food coloring — great tip! Hee hee, my kids (5 & 10) love cleaning the toilets with baking soda and vinegar. I always get a kick out of the excitement…hopefully they won’t figure out it’s dirty work anytime soon. now that’s just pure genius! she’s at that age where she wants to do everything, including vacuuming (thank you! ), and this will go over like gangbusters! 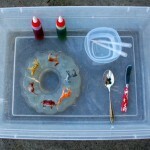 Ooh- we’ve got to do this, and now I know where the last few drops of food coloring should go too! nicole, you’ve given me some much-needed confidence to really put my foot down! napping has returned, although there are still days when it doesn’t happen. it helps to hear that a whole week without naps can pass, and we could still return to the nap routine. with a 5 month old, i feel the same way. it can be really exhausting to just run, run, run all day long. found this article at this website.